In order to receive dental implants, it is necessary to undergo some preliminary procedures. At the very least, a consultation will be required between the patient and dentist to determine the patients oral health. If the dentist determines that the dental implants can be placed successfully without any future complications, the dental implant surgery can be scheduled right away. If, however, the dentist determines that some other procedures may be necessary to make room for the implants, or to strengthen the surrounding bone structure, some more complicated preliminary procedures will be required. To get an understanding of what is required prior to receiving dental implants, continue reading below so that there are no surprises. Common with most surgical procedures, a consultation will be required between the dentist and patient as a first step. During this time, the dentist will do several diagnostic tests to determine whether or not the patient has sufficient oral health to receive dental implants. These diagnostic tests will include an x-ray of the mouth so that the dentist can see how strong the surrounding bone structure is. If the x-ray shows that the jawbone density and dimensions can support dental implants, the only other preliminary procedure that may be required is a tooth extraction. In some cases, however, the dentist may not be fully convinced with the x-ray results and will need to do a more advanced CT scan. 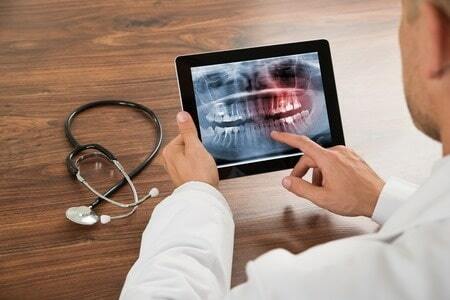 This will give the dentist a much more detailed image of the surrounding jawbone structure allowing them to determine if any other preliminary procedures, like bone grafting or a sinus lift, may be required. the patient has a severely damaged or infected tooth which will be replaced with a dental implant, thus requiring the removal of the tooth in the first place. the patient requires multiple dental implants to replace several missing or damaged teeth. In this case, it may even be required to remove perfectly healthy teeth that will be in the way of the intended fixed dental bridge. The tooth extraction procedure can vary in intensity from patient to patient. In most cases it will be a simple tooth extraction procedure which can be accomplished by using forceps to pull the tooth out and some local anesthetic for the patients comfort. 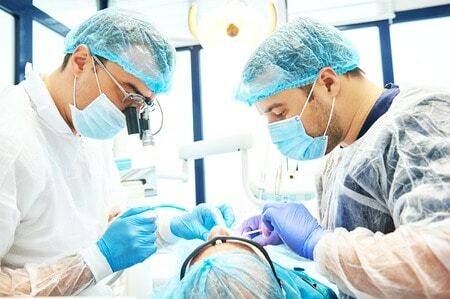 In less common scenarios where the tooth is severely damaged and cannot be simply pulled out with forceps, a surgical tooth extraction will be required. When a tooth falls out, the surrounding jawbone structure begins to deteriorate slowly. As this happens, the bone density will become weaker, while the height and width of the jawbone become smaller. The longer this area goes without a tooth or dental implant, the more it will deteriorate. Using one of these bone or bone like materials, a dentist or periodontist will surgically place this a piece of it onto the area of the patients jawbone that requires strengthening. There will then be a healing period that can take up to 8 months for the new bone to fuse to the surrounding bone. Once it is completely healed, the jawbone will be ready to receive it’s dental implant with a much less likely risk of failure. Both of these scenarios lead to the same outcome; the jawbone is does not have sufficient height for a dental implant to be anchored into it. As a result, any dental implants placed in this area will protrude into the sinus cavity, potentially causing further complications in the future. As a result, a sinus lift will be required to increase the bone structure between the jawbone and the sinus cavity, making more room for a dental implant to be placed.